In the middle of winter do you miss your summer tomatoes? Even the finest groceries have sorry looking tomatoes in January. What is so plentiful in August is not to be found once the frosts begin. If you have a garden or access to plenty of garden-fresh tomatoes, you can use your freezer to preserve the magic. Here is the challenge for a successful tomato freezing campaign: While you are admiring the mountain of tomatoes piled on your kitchen counter tops, decide how you will most likely use those tomatoes in the winter. The answer to this question will help you to decide how to proceed. Do you need tomato sauce or tomato cubes? Tomato slices or tomato salsa? There are lots of possibilities. If you will freeze your tomatoes in the form that you will use them, then it is almost certain that you will use them all before the next tomato season arrives. On the other hand, if you freeze your tomatoes in some clump that needs further processing after thawing, you probably won’t. Do the processing when you can do it in scale. Do it before you freeze your harvest. Take the time on the front end to prepare your tomatoes for use and they will be a blessing to you all winter long. For my cooking style and our taste preferences, I freeze tomatoes in three forms: cubes, slices, and sauces. The cubes and slices are loose so I can grab whatever number of them I wish with no effort. The sauce is frozen in containers of the quantity I need in soups and sauces. Take a look at your own recipes and meal preferences, then freeze your tomatoes accordingly. Here are instructions of freezing if you haven’t tried this before. Give it a go and don’t let one garden tomato go to waste! You will be enjoying them in February. A simple way to freeze tomatoes is to freeze cubes of tomatoes. These cubes, of course, will not do in a salad or sandwich. When it comes to cooking, they do shine. Add the frozen tomato cubes to recipes that call for stewed tomatoes. In most recipes you can add the tomatoes near the end of the cooking. Allow enough time for the tomatoes to thaw, warm, and cook a bit. They will be bright red in color and bright tomato in flavor. This preserving process is simple. Select tomatoes that are ripe but not soft and mushy. Part of their charm is the fact that these cubes are cubes and not spots of squish. Paste-type tomatoes work the best because the meat is firm and they are low in moisture. Additionally, the paste tomato improves in flavor when it is cooks. This tomato variety may taste ho-hum in its fresh state, but not so when cooked. Wash the tomatoes and allow them to drain and dry before processing. Even the most pristine-looking tomatoes have a thin layer of dust. For best results, peel the tomatoes before cubing. To do this, place the tomatoes in a deep bowl. Cover them with boiling water. Let them sit for a moment or two. (The blanching will loosen the skin of the tomatoes.) Drain off the hot water and now cover the tomatoes with cold water, the coldest possible. Let the tomatoes sit in the cold water for several minutes, then drain. The skins should come off easily at this point. While you are peeling the tomatoes, take another few seconds to cut out the stem ends. The tomatoes are ready to cube. Using a good serrated knife or a very sharp straight-edged knife cut the tomatoes into 1/2 inch cubes. If you are not using paste tomatoes you will be getting a lot of juice. In that case you might set up a situation where you can collect the juice to use in soups or stews. Juice is not part of the frozen cubed tomato project. Spread the cubes out on a cookie sheet with sides. The sides are insurance against tomato juice dripping down into your freezer during this next step. Spread the cubes so they are not touching. Place the tray of tomato cubes into the freezer for a few hours until the cubes are frozen solid. While the cubes are freezing label the freezer bag with a permanent marker. Once frozen, most cubes look alike. You will want to distinguish between your tomato cubes, eggplant cubes, and cucumber cubes. Once the cubes are solid, remove the tray from the freezer and pop the cubes loose with a spatula. Work fast to keep the cubes from beginning to thaw. Store the frozen tomato cubes in freezer bags. If you do not pack the bags too tightly you should be able to keep them flat and stack them nicely in the freezer. This stacking saves a lot of space. Keep the cubes frozen until you are ready to add them to a recipe. It takes only a few minutes for the cubes to thaw and cook when they are added to a hot dish in the making. For best quality, use the cubes within six months. 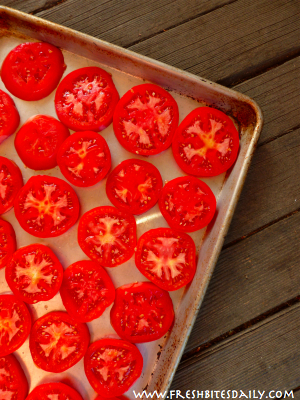 Have you tried freezing tomato slices? They are a superb topping for many casseroles and baked grain recipes — recipes that are cooked. One of our favorite uses of frozen tomato slices is in combination with roasted, frozen eggplant slices and cheese. Talk about remembering summer! I’ve served this dish to people who have asked where in the world I could have found these glorious tomatoes. The color is still good and the flavors are intact. This season I’ve grown the tomato heirloom, Druzba, for the first time. They are large and perfectly shaped and the flavor is super. Any tomato can be frozen in slices, but if you can manage to get Druzbas, you will be delighted. Just seeing the slices on the cookie sheet make me smile. You will smile with satisfaction, too, looking at the fruits of your labor and dreaming of winter. This project is so easy, it’s almost embarrassing to write it out. You’re going to love this. Wash the tomatoes and allow them to drain and dry. Cut out the stem end and slice off the blossom end. If you are making roasted tomato sauce, toss the blossom ends into the crock pot for a little repurposing. Otherwise the chickens or compost bin will thank you for the contribution. Slice the tomatoes into 1/3-1/2 inch slices. Arrange the slices on a cookie sheet, one layer only. Do not overlap the slices. Place in the freezer until the slices are solid, for about 2-3 hours. Meanwhile get your freezer bag(s) ready. Label the bags using a permanent marker. Remove the cookie sheet from the freezer and work fast to keep the slices from thawing. Pop the slices loose from the cookie sheet with a spatula and place the slices in freezer bags. Arrange the slices inside the bag so that the bag will lay as flat as possible. This helps with stacking the bags, saving space in the freezer. Lay the bags on the cookie sheet. Yes, you can use the same one. After a couple more hours in the freezer, these bags can be stacked on one another. Make a space in the freezer to facilitate this stacking. Tomato sauces can be stewed or roasted. The roasted sauces can be done in the oven or in the slow-cooker. 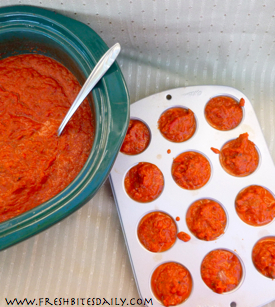 Roasting tomato sauces in several slow-cookers at a time have changed my life. It is so quick and easy. The heat is on the back deck and the back porch in the crock pot. However you make your sauce, it will be far tastier than any commercial counterpart. 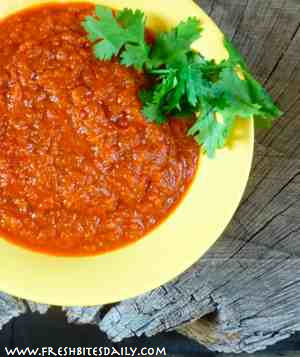 Read more about our roasted tomato sauce. Having the luxury of making your own tomato sauces means you can have several variations. I do one with Italian flavors, two different ones with Mexican flavors, and one that is so thick that it is almost a tomato paste, only much tastier. When choosing freezing containers for these sauces, I consider how much of the sauce I will need for a particular recipe. Wisdom dictates using a container the closest in size to what I will need for a recipe. Often I double or triple a recipe and use two or three of the containers of frozen sauce. You will find yourself being creative based on what you need and what you have to execute the job. Often I will use a heaping tablespoon of tomato paste in a soup or in cooking beans. The answer to this is freezing the paste in tiny muffin pans. We happened to have a stash of these pans from some project a few years back. Use what you have! I fill the muffin tins with a heaping tablespoon (remember, that’s the measure I need) of my paste and then place the tins in the freezer. After the paste is frozen solid, I pop the paste “muffins” loose, put them in a freezer bag and return them immediately to the freezer. The muffins stay loose and readily available for when I only need one or two. How many cans of half-used tomato paste have you lost because it was just too much to use? This plan ends waste! Freezer containers come in a variety of sizes and shapes. Go with the size you will need for most of your recipes. Also go with shapes of containers that will stack and store efficiently. This means sqaure or rectangular. The round containers result in a lot of lost freezer space. Label every container you use. You may think you will remember what is in every container but you will not. Besides, you can send one of the kids to the freezer to retrieve what you need and they will be able to find it. Since I make a variety of sauces, I get quite specific with my labeling. I know exactly what I have in that container because of labeling detail. For this family, Italian sauce with enchiladas just doesn’t work. For those we need the sauce labeled “tacos and enchiladas”. Labels need not be extravagant. Use masking tape and a permanent pen for marking before filling the containers. If you wait until the containers are filled and capped, the warm lids may also be sweating a bit. The tape doesn’t stick. Ask me how I know. When filling your containers for freezing, leave a generous 1/2 inch of head space. The sauce will expand when it freezes. The head space allows for this. Without it, the freezing sauce will pop the lid loose. Then begins the freezer burn and you lose some of the quality in your precious sauce. The handiest use of frozen sauce is thawed frozen sauce. I will often pull out a container early in the day to thaw until dinner preparation. Allowing a container to sit at room temperature overnight accomplishes the same thing. Once the sauce is mostly thawed, put the container into the refrigerator. A couple of days in the refrigerator will usually thaw a container of sauce. It depends on the size of the container. Thawing on the stove is possible, but it is a nuisance. Put a little water in a sauce pan and place your chunk of frozen sauce in the pan. Place the pan on the stove with the burner set at low. Put a good fitting lid on the pot. Stir often. You really have to watch this for burning. For best results, plan ahead and thaw slowly. I understand you can thaw sauce like this in a microwave. We do not own one and have not tried this method. Check elsewhere if microwave thawing is you preference. This is a lot of information about sauces. I have to admit there is some work to doing them but I don’t care how much you spend on a bottled gourmet sauce, it will not hold a candle to the sauce you make in your own kitchen. As any fine Italian restauranteur will tell you, your sauce is your signature. This is your opportunity! We outline three methods for freezing tomatoes. This is freezing tomatoes in slices. Cut out the stem end and slice off the blossom end. Place in the freezer until the slices are solid, for about 2-3 hours. Pop the slices loose from the cookie sheet with a spatula and place the slices in freezer bags. Lay the bags on the cookie sheet. After a couple more hours in the freezer, these bags can be stacked on one another. 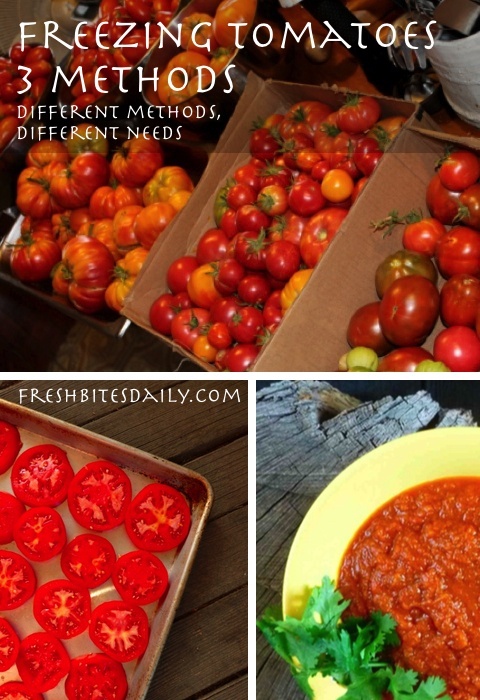 3 Comments on "Freezing Tomatoes: 3 Ways To Preserve The Tomato Harvest"
Thank you so much for these great methods to save our beautiful tomatoes! I will try at least two of them, maybe four. Something to look forward to about winter!